At least three people have died in fast-moving floodwaters in North Texas as freezing rain and flooding pummeled the state and other parts of the central U.S. on Friday, with forecasters warning that the chilling weather would worsen over the holiday weekend. 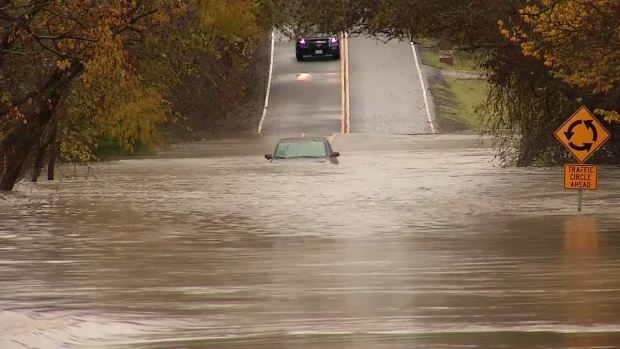 Forecasters issued flash-flood watches and warnings from northern Texas up to St. Louis, with up to 4 inches of rain reported in some places as the storm system makes a slow trek to the northeast. Freezing rain and strong winds also caused at least two fatal traffic accidents in western Kansas on Thursday. In North Texas, where more than 4 inches of rain fell overnight in the Dallas-Fort Worth area -- pushing the annual rainfall total into the record books -- three people died after being washed away in the deep, rapid floodwaters. At least one other person is missing. Firefighters in Garland found 29-year-old Benjamin Floyd of Wylie dead inside a submerged Hyundai Elantra, fire department spokesman Merrill Balanciere said. Crews found the body of 33-year-old Sandra Jones just after 8 a.m. downstream from her vehicle just west of Fort Worth. Jones' car was washed off the road in waters flowing 10 to 12 feet above the banks of Rock Creek, Johnson County Sheriff's Office spokesman Tim Jones said. Johnson County sheriff's deputies responded to a high-water rescue early Friday after three people were swept into the water overnight. Two people were rescued, but the third person, identified as 48-year-old Jose Vargas, was recovered Friday morning near Mansfield, about 18 miles southeast of Fort Worth, officials said. Firefighters in Fort Worth are waiting for the water to recede before deploying a dive team to continue searching for another woman whose car was swept away in a flood, according to spokesman Kyle Falkner. A total 55.23 inches of rain has been recorded at Dallas-Fort Worth International Airport this year, topping the annual rainfall record of 53.54 inches set in 1991. National Weather Service forecaster Matt Stalley says rain is forecast in the area through Sunday. The state transportation department discouraged travel in the Texas Panhandle after the storm front left dozens of major roads, bridges and overpasses covered in ice and snow. Winds whipping around snow also kept visibility low in some places. Elsewhere, an ice storm warning was in effect for western Oklahoma until noon Saturday, while a winter weather advisory and a flash flood watch were issued for parts of central Oklahoma. The National Weather Service warned of freezing rain and sleet in northern and western Oklahoma Friday, with up to a half inch of ice possible in some areas. The weather service also issued flood warnings throughout Arkansas, saying much of central and western Arkansas could see 5 to 7 inches of rain through Sunday, while the Ouachita Mountain region could get more than 8 inches. The Kansas Highway Patrol attributed two traffic fatalities on Thursday to icy roads in western Kansas. The weather service issued a winter storm warning for sections of central and southern Kansas through early Saturday and said up to a quarter inch of sleet and ice could hit the state by Friday night. NBC 5's Eric King contributed to this report.